Sometimes I wish I could freeze time and keep my munchkins small forever. But nothing stays little and cute forever (*sigh*) so I made it a priority to capture my kiddies growing up by taking a monthly photo. 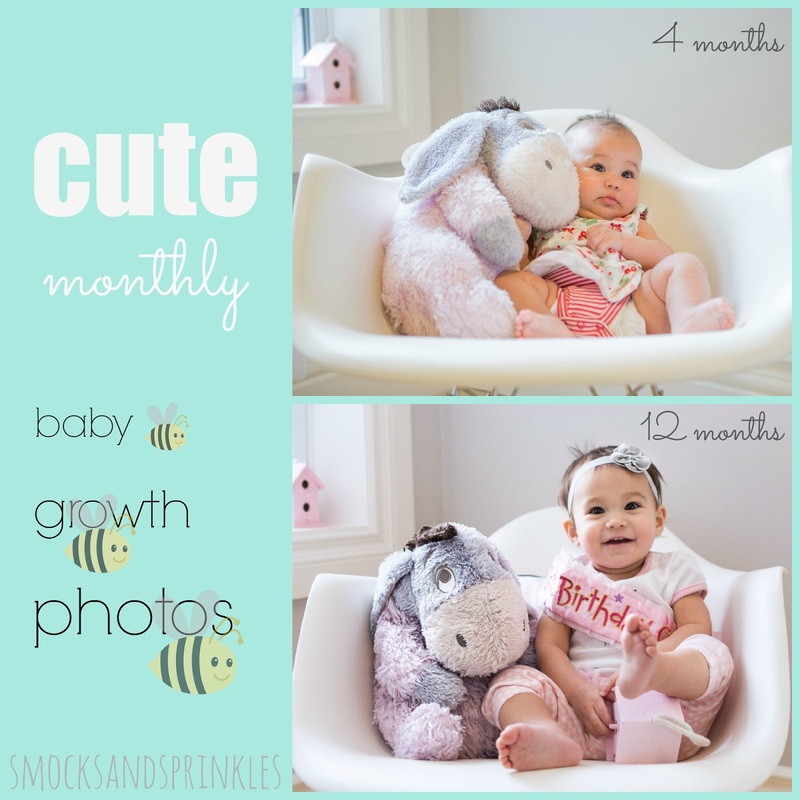 The easiest way to track growth in pictures is to simply photograph your child with the same object every month. The object could be something meaningful to your family (i.e. sports paraphernalia, something associated with a parent's occupation etc.) or your baby's first stuffie. 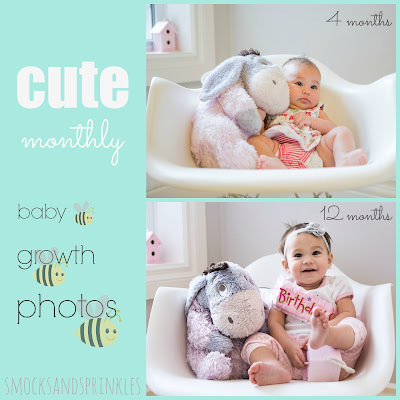 A super cute idea is to photograph your baby beside the family pet every month. Guaranteed way to score some adorable pics! 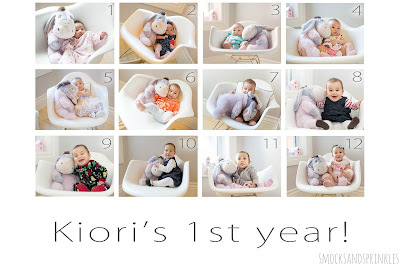 Photograph your child on the same chair or inside the same container (i.e. large basket, bucket, wooden box etc.). Photograph your child growing into the same initially over-sized shirt/outfit (i.e. a sports jersey of the parent's favourite team). Buy a large monthly desk-sized calendar and photograph your baby beside or on top of the corresponding month. Take a picture of your child lying/standing beside those awesome gigantic wooden rulers I have drooled over on pinterest. You can even make your own over-sized ruler if you're feeling really crafty. 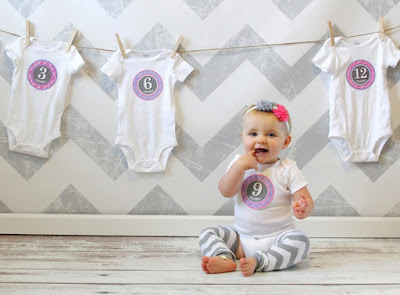 One ridiculously cute idea I stumbled upon is to have a clothesline with monthly baby onesies strung up and your baby wearing the corresponding month onesie in the foreground. Sounds confusing...please refer to image below to fully comprehend how adorable this idea is. Turn your baby into a clock! Cut out a large circle out of Bristol board and add in numbers (1-12 just like a clock). Lie your baby down on the clock with their head pointing towards their age in months. Totally wish I had done this one with my kids! monthly stickers- there are so many cute designs out there in different shapes, sizes and colours! Tip! Photograph your child in the same spot and background (try to keep it simple) with the same lighting every month. Natural lighting always looks best so open up those drapes and let some sunshine in! 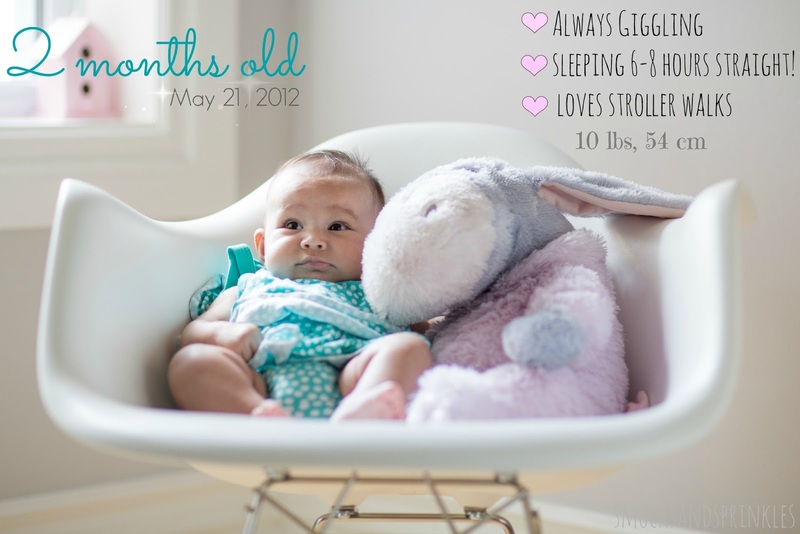 If you want to get really wild, try adding text to the photo using online graphic design software such as picmonkey or canva to document your child's monthly height, weight and significant milestones. At the end of the year put all 12 photos together to create a poster showcasing your baby's growth. Remember to print out extra copies for proud grandparents to show off! 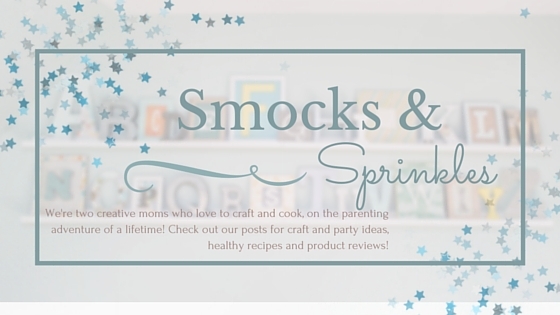 Do you have any fun ways to track and celebrate your baby's growth? Please share with us below!